The morning after the bomb, I went into the Flight Service office and helped set up a small briefing room where crew members going out on flights could come in and have a cup of coffee and look at informal photos of the 103 crew. It was a place where they could feel free to cry, have a hug, and talk about their friends and former crew colleagues. They could also read the telegrams sent by The Queen, the Prime Minister, etc. The first week was particularly difficult as it was over Christmas and it was mainly junior crews flying. It was during that first week that the Press were speculating that the aircraft had suffered from metal fatigue, which added to the fears of the crews flying out of London. Although it was obvious that 103 has been brought down by a bomb, this could not be announced until absolute proof had been obtained, which took a full week. 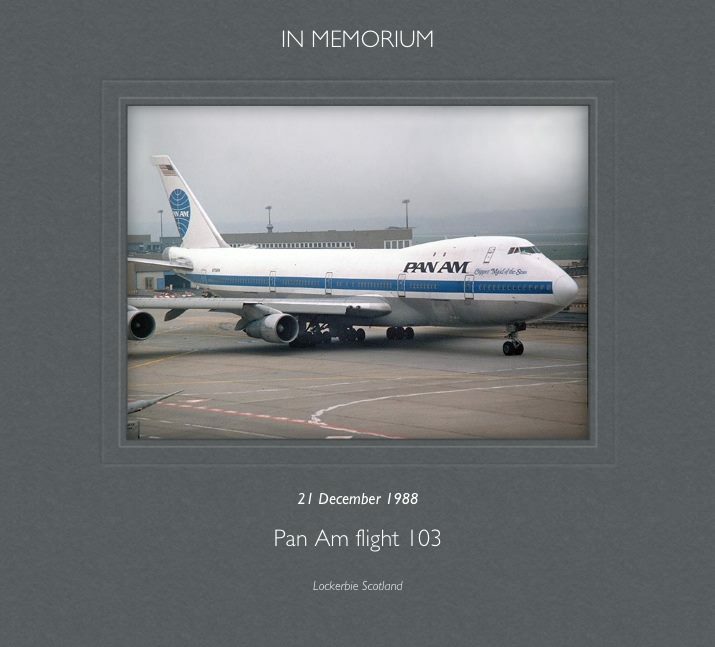 When Pan Am flew the families up to Lockerbie for the first memorial service, I worked on the flight up to Glasgow and then we went on a three hour bus trip. It was very difficult working on that flight and then returning to London. The next day Pan Am had their own memorial service with over one thousand Pan Am people present. The US ambassador, the Bishop of London and the top Pan Am hierarchy were there. I was persuaded, very reluctantly, to do the memorial speech. It was the most frightening thing that I have ever done, especially since my best friend, Gerry Murphy was the senior Purser, working first class. It seems so hard to believe that it will be 26 years this year. It never seems to get any easier. On a trip later in January to Lockerbie with a sister of Gerry Murphy, I met some of the police and security people who were dealing with the aftermath of Flight 103. They told me that at dawn on the 22nd of December it was obvious a bomb had caused this devastation. Yet, unfortunately, this could not be announced until they had absolute proof, which took a full week. It was during this period that the media started to write stories trying to claim that the aircraft had suffered from metal fatigue and that probably most of Pan Am’s 747 aircraft had the same problem. It was so awful for the crews who had to fly out of London during this seven day period over Christmas. It seems as if the Lockerbie disaster is never out of the news. Ironically, one year ago I met a man who told me that he was six years old and was from Lockerbie. Apparently, his father was returning from work on the 21st December and actually saw Flight 103 blow up. He telephoned 999 and all the hospitals in the area were alerted and called in off duty staff. Sadly, they were not needed, just the fire crews. Three years ago, at my father’s funeral, a passage was read which moved me deeply. I found it particularly comforting then and I feel that it is appropriate today. Let it be spoken without effort, without the ghost of a shadow on it. I am but waiting for you, for an interval, somewhere very near just around the corner. Ann Hawthorne Bouras (Anderson) Purser 1961-1964: My family moved to Lockerbie, Scotland when I was nine years old. We lived in a small village called Bankshill. I attended the local school across the street from my house. 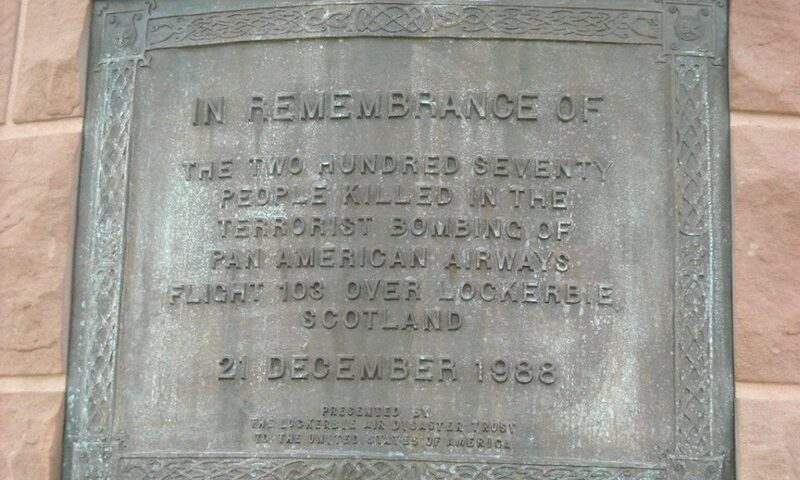 When I turned eleven years old I went to Lockerbie Academy. 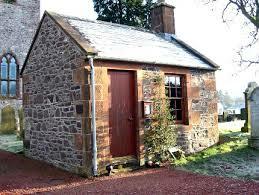 My friends, the Wilsons, the Armstrongs and the Howatsons lived on farms just outside the town of Lockerbie. My father owned a business in Lockerbie, just off the main street. 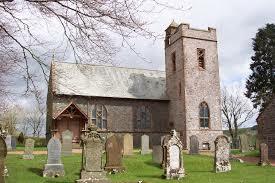 By the time I turned 15, I was asked to play the organ on Sundays, at Tundergarth Church which is located between Bankshill and Lockerbie. Two years later my family moved back to England. I was hired by Pan American in 1960 and was flown to New York to start my training. Yes, I remember that fateful day when it was announced over national television that Flight 103 had exploded over Lockerbie, and that there were no survivors. I was sitting with my mother in her living room listening to the details and we were both in a state of shock. We cried, we prayed for the families whose loved ones were lost. As the TV stations began to show pictures of the total devastation and turmoil I began to recognize the areas where parts of the plane landed. The cockpit landed in the field opposite the Tundergarth Church, where I played the organ and next to the Wilson’s farm. I travel to Lockerbie every year to visit this wonderful memorial and to write a message in the book. I talk to my friends, the Wilsons, the Armstrongs, and the Howatsons and we talk about Pan Am 103 and how several lives were changed forever because of this tragedy. Kay Odenwald: Difficult memories….Linda Notti and I were sent from In Flight and were on the first flight out of JFK to assist in London. On that flight were families of the victims, Milutin Velimirovich’s wife, Dr. John P. McCann , the corporate Medical Director of Pan Am, mechanics, ground personnel and corporate. Our job (Linda and I) was to coordinate with the family’s of the crew on flight 103. We had the unpleasant job of getting dental records and coordinating all the details needed during that very emotional time. I remember we had a white board in the office with each crew members name on it and once they were identified, we coordinated all the details to get the remains back to each family. It became personal for Linda and me. Some of the crew were able to have open caskets and families wanted them buried in a Pam Am Uniform. Linda and I took care of all that stuff. 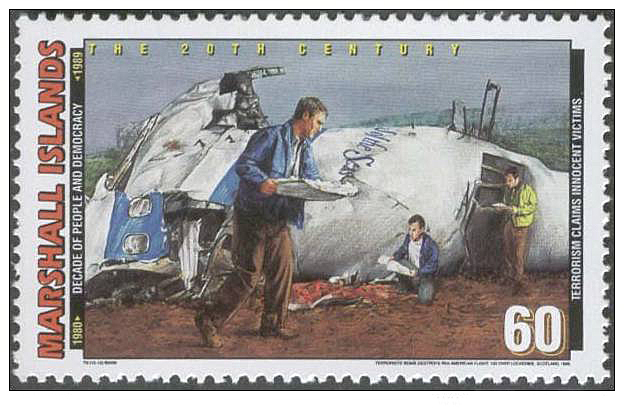 There was also a Pan Am employee assigned to each passenger and crew member and they would travel with the remains to the final destination. Lisa Schwenk: I flew as Purser for Pan Am out of San Francisco. I was on this airplane many, many times. I loved how Pan Am would name their airplanes. I remember one flight getting ready for departure. There were always two pursers on a 747. I was up in the First Class cabin coordinating services with the other Purser. I can’t remember her name… As we were talking “The Maid of the Seas” pulled in to the gate beside us. We watched it slowly pull in along the left side of our aircraft and block in. My fellow Purser looked at me and said “Lisa, I just got chill bumps all over my body. Something terrible is going to happen to that airplane one day. I don’t know what it is, but something terrible is going to happen.” It was such an odd experience – I remembered it. Who wouldn’t? I also told my friend Michele Burdick who asked me to recount this story. I remember coming home from Frankfurt the day before 103, and going through security in Frankfurt where there was supposedly a “high alert” for security in place. No one even wanted to look at my luggage – which was the norm. Dear Michele was the first one to call me to make sure I was okay and home and not on that flight. But Pan Am was like a family, and we knew almost every crew member on 103. May God bless all the families who hurt today in remembrance of their lost ones along with all those innocent victims on the ground. Hans Vollmer: I was flying London’s out of JFK during that December and after Flight 103 we took family members over to London to identify remains. It was awful. The entire First Class section was full with them. One father kept on banging his head on the tray table all night long. While everyone else was sleeping all you could hear was the thud of his head against the tray table. Truly my saddest flight. Walking into the crew lounge in London the next day was very emotional. London based flight attendants were camping out there comforting each other. So senseless, so many beautiful lives lost. Peter J. Ashford: Though I was not cabin crew I worked for Pan Am for five years in Alaska. 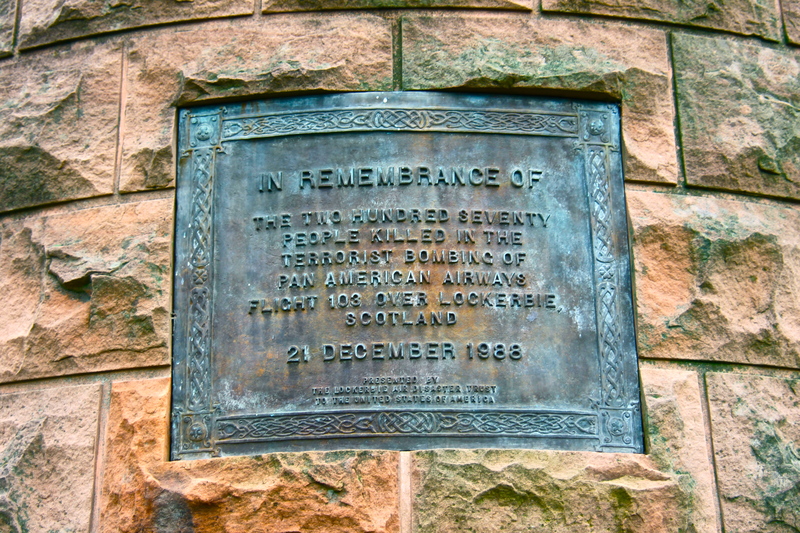 In 1999 I visited Scotland on a business trip and made sure I visited the memorial in Lockerbie. It was a very moving visit; I was the only person in the cemetery on rain-soaked windy day. A tragedy for all concerned on that awful night en route to JFK. Brenda Anne Dymock: Thank you to all who contributed . all of the Memorial services . This was ,and still is one of the most difficult trajedies I have ever dealt with . Our thoughts today are with all involved . We will always remember,with great sadness. 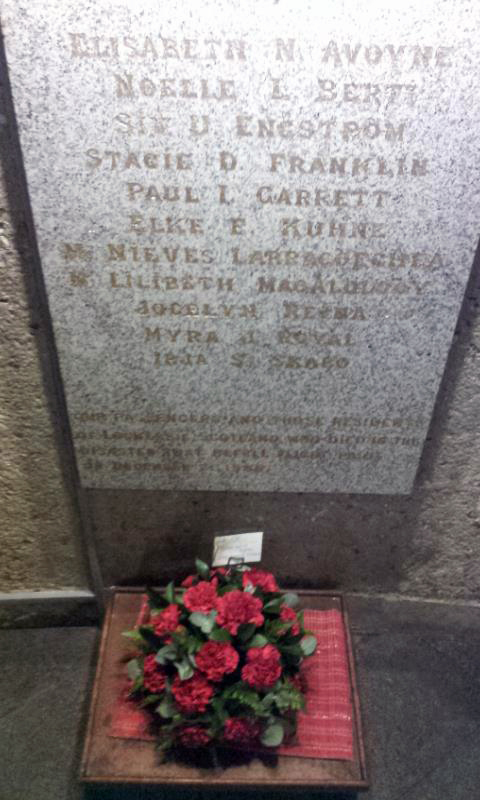 Our floral wreath was delivered to the Memorial Garden today as we have for all of the 26 yrs. In our hearts forever, as the tears still fall . Natalie Bertini-Johnson I was a LHR based flight attendant in 1988 and took flight 103 on Dec 20th to celebrate my 21st birthday in New York. My roommate worked the flight. It was a devastating day for all of us to hear we had lost family and friends. I knew it would be the end of our Pan Am. by the ending and we read it at her celebration of life at the beach at Waikiki. It seemed so fitting because about a year earlier she and I were logging her donation items for the Pan Am collection at the Pacific Aviation Museum on Ford Island in Pearl Harbor. Here was a photo of the last flight Pan Am flight out of HNL and we both had chicken skin when we saw the aircraft was the Maif of the Seas. We miss Paula so much as she was an excellent historian on our beloved Pan Am. 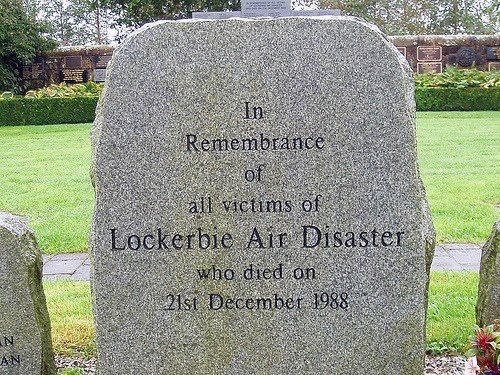 I was home the night of Lockerbie. My neighbor, who was an American airlines flight attendant heard the news first and called up to see where I was. Complete and total shock sent in. It was the Christmas season and we had a Christmas pageant rehearsal that night at church. All I could think of with all of our little angels dressed for the pageant was the Angels that we had lost on 103. It was a nightmare that continued to unfold! Thank you all! I was a flight attendant seeing the world because of PAA. It was a honor to be part of the PAA family and still is. Will never forget this experience ever. 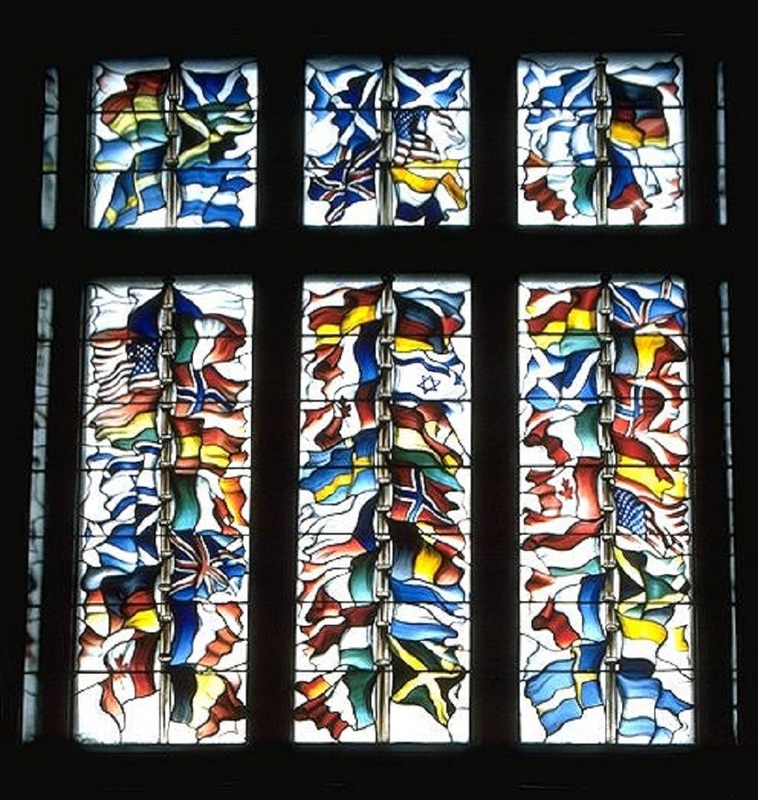 Prayers to all the families who lost their loved ones and friends that sad day in Scotland. I was not flying during that time. I had taken a personal leave & I was away at a retreat when I heard the news. I’ll never forget how a certain stillness & numbness overcame me with disbelief. My mind raced with so many passing thoughts as to what happened? I couldn’t wrap my head around the idea of an airplane breaking up into pieces at 31,000 ft. When the news broke a week later that it was a terrorist act numbness turned into anger & fear for my colleagues “ask at PAA. I am honored to have been part of the PAA family & will always hold them dear to my heart. Today is a sad anniversary in the world of aviation, especially for those of us who are part of the Pan Am family. I suspect that for many of us, it is still too painful to address it directly. It is then a great resource to know that we are part of a larger family. I am today especially thankful for the kind support that comes from so many within the aviation community. It is a great resource at a time of sorrow. Sending hugs to all of you out there. all of the Memorial services. This was,and still is one of the most difficult tragedies I have ever dealt with. Our thoughts today are with all involved. We will always remember,with great sadness. Our floral wreath delivered to the Memorial Garden today as we have for all of the 26 yrs. In our hearts forever, as the tears still fall . I’d been out to dinner with a friend. When we got back to my flat- my answering machine was full which was odd. I rewound it. The first message was from my father- I will never forget his voice- then with each message it got worse. Elke K. had spent the previous Xmas eve with me in my flat at one of the most special evenings for all who were there. The next morning I went to the airport. Pan Am wasn’t equipped to handle what had happened. Some of us answered phones and gave out a number to call to people who were “searching” for their loved ones. Hank Auerbach was right there with us. We were like robots in shock. I went to my mailbox before heading home and grabbed my mail and headed for the tube. My heart hurt. I would be flying out on Christmas Eve to spend Christmas with my girlfriend in Miami. When I got on the train I opened a Christmas card. It said, Dearest Ann, Let’s live it up in ’89! Love Elke. I crumbled on the train. A complete stranger- helped me. I recently ran into someone who knew Nieves as I was voting in November. Their sweet faces never fade from any of our memories. They never ever will.